As a Mountaindog reader, you are at the forefront of cutting edge information both about nutrition and training to help you succeed and excel far beyond your peers. Fat loss is something that seems universally pursued. Products flood the market with promise of fast fat loss, effortless fat loss, dropping x lbs in 2 weeks, etc. One such supplement that has been hovering in the background for a long time is carnitine. Let’s first get on the same page about the process of fat loss (lipolysis) and metabolism before we delve into how and why carnitine is effective. Fat loss stems from the mobilization of fat stores, which are then transported to where they can be used for energy by being broken down. Our body can utilize all 3 macronutrients for fuel: protein, carbohydrates, and fats. Protein oxidation is not efficient and our body will use more readily available fuel sources first like carbs and fat. When carbohydrates are present, the body preferentially switches to a high percentage of energy coming from carbohydrates. When the body enters into a caloric deficit it can end up with a net removal of triglycerides, the molecule that fat is stored as, from tissue to be used as fuel. The triglycerides, made of a glycerol backbone with 3 fatty acids attached, need to have the fatty acid tails hydrolyzed from the glycerol backbone before transport and oxidation. The enzyme that hydrolyzes the fatty acids is hormone sensitive lipase (HSL). HSL can be activated by a few different pathways: beta 1-2 receptors, which increase intracellular cAMP; Natriuretic peptide receptor A, which increases cGMP; and AMPK, which is increased by energy depletion in the cell. Another receptor to keep in mind is alpha 2 receptors, which decrease cellular cAMP, from which we now can guess will decrease lipolysis. A well known alpha 2 receptor blocker is Yohimbine, which is thought to help with stubborn fat areas, which seem to have a predominance of…….yeah you guessed it: alpha 2 receptors (Langin 2006). Carnitine comes into play once the fatty acids are mobilized and are ready to be metabolized for energy. This takes place in the mitochondria and is termed beta oxidation because of the biochemistry of the metabolism and oxygen being needed for full metabolism. The metabolism will take place inside of the mitochondria and cannot occur without carnitine. So to say it’s important is an understatement. Carnitine acts as a transporter for the newly free fatty acids. It helps transport the fatty acids across the mitochondrial membranes so they can be oxidized. The transport is called activation of the fatty acids and is accomplished through a transesterification reaction. The transport and actual metabolism are critical because any fatty acids that were released that are not transported/metabolized will simply be redeposited into new triglyceride stores. Digging deeper into the carnitine rabbit hole, we find that there are two different cellular pools of carnitine with each having distinct purpose. The mitochondria have 2 different membranes, and there are two different carnitine pools to transport fatty acids across the different membranes. The first pool moves the fatty acid to-not through-the inner (2cd) membrane, and the second pool receives the fatty acid on the matrix (inside of the 2cd membrane). Carnitine palmitoyltransferase 1 (CPT 1) is the enzyme responsible for the transfer of fatty acid across the inner mitochondrial membrane. Once the transfer is complete, we can release the fatty acyl group and it combines with a coA, while the carnitine reverts back to its free form. The CoA-fatty acyl group can now enter beta oxidation, which releases Acetyl-CoA molecules, which enter the krebs cycle to be processed into ATP by using oxygen as the final electron acceptor. The second role that carnitine plays is accomplished by the matrix free carnitine (the acceptor of the fatty acid across the second mitochondrial membrane.) This free matrix carnitine can act as a buffer by combining with Acetyl-CoA that accumulates. Acetyl-CoA is generated by the glycolytic pathway by way of pyruvate dehydrogenase (PD). If PD is upregulated because of increased demand, carb heavy meal, HIIT training, increased glycogen stores, anything that increases the demand for glucose as fuel, Acetyl-CoA can be generated faster than it is used in the citric acid cycle. As acetyl-CoA accumulates, the free carnitine inside the mitochondrial matrix binds to the Acetyl-CoA which decreases the amount of free carnitine available for fatty acid transport. Free carnitine can be reduced by 75% during HIIT, this down regulates the amount of beta oxidation that can take place in the cell (Stephen 2001). Stephen also showed that there was a 35% decrease in long chain beta oxidation when VO2 max was above 75% and the free carnitine pool dropped 65%. Roepstorff et al (2005) showed a 2.5 fold decrease in beta oxidation during 65% VO2 max when free carnitine levels dropped by 50% from the elevation of pre exercise glycogen. Putmanet (1993) supports the hypothesis of elevated free carnitine levels increasing beta oxidation. The researchers accomplished elevating carnitine levels by depleting glycogen prior to 75% VO2 max training to failure. Philip Randal has a group of experiments on fuel selection and competition that to this day are referenced by researchers and biochemistry books. He describes the feedback loops that determine the fuel selection by the cell. Beta oxidation increases Acetyl-CoA levels,elevating citrate and glucose-6-p, which then down regulates carbohydrate flux through inhibiting key enzymes in carbohydrate metabolism. Stephens built off this and showed an infusion of carnitine overnight returned acetyl-CoA to basal levels vs the control that had suppressed levels. Their conclusion was beta oxidation was upregulated by the carnitine and also showed a 40% decrease in PD activity. Now that we know we want more carnitine in our cells, the question becomes how do we go about doing that, because the difficulty of raising carnitine levels is the main reason why people report no results. Carnitine has been shown over and over to be very poorly absorbed by oral ingestion even when administered as an infusion, Watcher (2002), Barnet (1994), Vulkovich (1994), Brass (1994). The problem is people without a carnitine deficiency (vegans and vegetarians are at risk) do not have low plasma levels. The level of carnitine in the plasma is not the rate limiting step, and raising the plasma levels does not create greater flux into the cells. Because there is a transporter for carnitine it cannot simply move across the cell membrane. Carnitine needs to be actively transported into the cell and without this the cell carnitine levels will never change. The organic cation transporter N2 (OCTN2) is responsible for the movement of carnitine into cells. Without this transporter you can have a condition of primary carnitine deficiency, where patients present early in life with hypoketotic hypoglycemia, or later in life with skeletal or cardiomyopathies. Luckily we know a way to upregulate this enzyme: insulin. Insulin upregulates the Na/K pump on a cell and luckily for us OCTN2 is a cotransporter of carnitine and Na. A higher Na concentration can be harnessed to drive more carnitine into the cell. Insulin also increases the amount of OCTN2 available for use. The Stephens group undertook a variety of different studies that look into this mechanism and then how to apply it. These studies direct us to the optimal protocols for raising cellular carnitine concentrations. 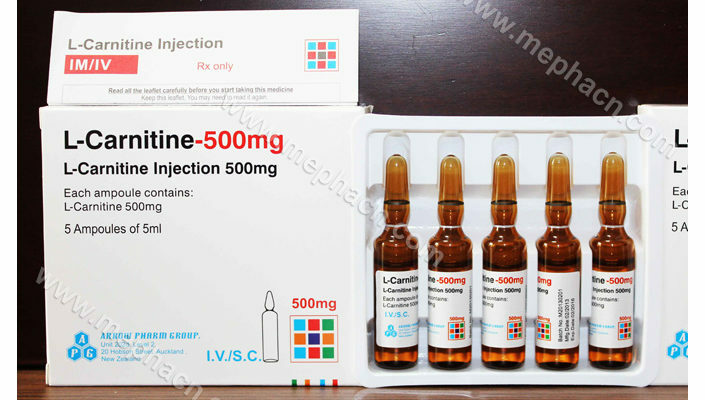 The experiment showed that a combined carnitine insulin infusion could raise cellular carnitine concentrations, showing a 15% increase of muscle carnitine, decreased PD activity by 30% and 40% decrease in muscle lactate, while long chain acetyl-CoA increased 30% and muscle glycogen increased by 40%. The rationale behind this data is carbohydrate flux and how it was decreased as shown by the PD decrease, lactate decrease and increase in glycogen. Fatty acid metabolism increased, determined by both the increase in long chain acetyl-CoA as well as cell fuel selection being glucose dominant or fatty acid dominant (they are inverse of each other). This shows that increased carnitine can change the fuel selection of the cells to be more fat dominant and store more glycogen. Now that we understand the benefits of supplemental carnitine and the mechanism behind those benefits, we can begin to extrapolate from the Stephens group studies, we find they set out to discover just how high insulin levels need to be to maximally stimulate carnitine uptake. They found that level to be 90mU/l. Stephens group has another study showing that 2g of oral carnitine taken with 80g of carbohydrate twice a day for 24 weeks was sufficient enough to raise carnitine levels by 21%. This increase was accompanied by a 50% decrease in glucose usage during low intensity exercise, and muscle lactate build up was reduced by 44%. Better yet they showed an increased work output of 35% over the control group. Using some extrapolation from the Stephens studies to develop our own protocol we find injectable is by far the best means of administration because of the terrible (15% or less) rate of absorption of oral carnitine. OCTN2 is upregulated not just by insulin but by PPAR alpha. Hyperglycemia both acutely and chronically can reduce PPAR alpha. AMPK, exercise and biotin all have the ability to raise PPAR alpha. We want the insulin area under the curve (AUC) and the carnitine AUC to overlap as much as possible. These curves will change based on the types of carbs or insulin used, how carnitine is administered and as well as insulin resistant status. Thinking about pathophysiology It is easy to come to the conclusion if you have impaired glucose tolerance (diabetes or pre diabetes) ergo insulin resistance of some form, that your response to carbs will be different. Your insulin response will take longer and may not drive carnitine as well as someone who has a normal insulin response. For the fastest results we want to load the muscles quickly. That means loading amounts that cannot be achieved with oral ingestion, since oral ingestion and absorption in humans is capped at 3g, and only 10% will be absorbed anyways. A loading dose done for a week can be anywhere from 4g spread through the week for a small person (under 170), to 6g for a medium person (under 200), all the way to 10g for someone in the 250lb range. I have not found any hard numbers on this since the studies have not been done using protocols like this. Moving into a maintenance mode you can cut your dose down by 30% or so. Once the mitochondria have elevated levels of carnitine, the elimination rate greatly decreases. A subjective way to test how well your cells are being loaded (based off one of the Stephen group studies), is to have a set time or heart rate cardio session to draw a baseline from. When the cells carnitine levels start increasing you will notice a performance improvement either in time or RPE. Yes, this is subjective but it can at least give some idea if your protocol is working. There are many benefits to health as well, not just performance and fat loss. Carnitine has been researched for use in myopathies, neuroprotection and cognition, liver disease, cardiovascular disease, and more; so there is quite an extensive list of reasons why carnitine can be a very effective fat loss adjuvant. Through mountaindog training and a proper diet, you may find that edge you have been looking for with carnitine supplementation. Don’t forget during a muscle gain phase you can end up leaner and growing better so it can be used during both off season and prep. So the million dollar question is how do we use this? I will tell you how I take it personally. First of all as Ryan mentioned you have to load it effectively into muscle and I prefer to do this pre-contest as the beginning of my “diet”. To load it fast you need a little bit of insulin, if you do not want to go that route it just takes longer to load. That is up to you. I use my supplement PartitionMD so I can use less insulin also. I use insulin with it for 2 weeks. I only use Humalog and I use it under the care of one of the most sought after doctors in the world. I take 8ius of Humalog, 2 caps of PartitionMD, with 400 mg of carnitine about 15 minutes before I train. I have seen plenty of good results to not think more carnitine is better that that. I have tried up to 1000 mcg before training to be honest! Once the 2 weeks is up I drop insulin and stay at 400 mg dose until I feel like my fat is gone which is usually 1-2 weeks before a show. With insulin let me be clear, I am not telling you to do it, as if you don’t use carbs with your pre-workout meal and intra as I do, you could risk the nice side effect of DEATH. Yes insulin can kill you. This dose with the amount of carbs I use is something I have never had one issue with. Thanks for reading, I hope this kind of information, honest and not BS, can help you achieve your fat loss goals. Oh one other thing. I get my Carnitine from Synthetek. It is perfectly legal. There are racehorse sites that sell it, but people report it burns a tad upon injection. The synthetek brand passes through an insulin needle like water. You can’t feel a thing. Barnett C, Costill DL, Vukovich MD, Cole KJ, Goodpaster BH, Trappe SW& FinkWJ (1994), Effect of L-carnitine supplementation on muscle and blood carnitine content and lactate accumulation during high-intensity sprint cycling, Int J SportNutr 4, 280–288.